It’s not quite a meltdown, but NuScale is on ice for now because of investor problems. NuScale Power is facing an old problem. The startup -- which is developing a small, modular nuclear power plant -- has suspended operations due to a cash crunch. The Securities Exchange Commission has filed an action against its lead investor, The Michael Kenwood Group. The SEC action does not allege any wrongdoing on the part of NuScale or its activities. The company is not even a party to the action. However, the suit currently prevents Kenwood from meeting its funding obligations to NuScale and as a result, NuScale has gone into hibernation. The company, founded in 2007 from research conducted at Oregon State, has raised $35 million in VC funds and says it has met most of its milestones. To circumvent the problem, NuScale is currently seeking other sources of funds. CMEA is a current investor. NuScale is part of a wave of startups and national laboratory projects geared to reduce the cost and headaches associated with nuclear power. Conventional nuclear plants can take years, if not decades, to build and often exceed their already astronomical budgets. Constellation Energy last year canceled a plan for a 1.9-gigawatt nuclear plant in Maryland because it did not want to pay the fees associated with a loan guarantee. The estimated cost of the plant was $6,000 a kilowatt, which would have made it more expensive than natural gas (under $1,000 a kilowatt), wind ($2,000 a kilowatt) and solar (approaching $3,000 a kilowatt installed for large projects). Even if battery and storage sold for $2,000 a kilowatt, wind and solar still seem like good deals in comparison. NuScale believes it can bring down the price by swapping large, centralized reactors with 45-megawatt reactors chain-ganged together. A 540-megawatt plant made up of 12 NuScale reactors strung together would cost $4,000 a kilowatt, according to the company, and ultimately would produce power for 6 to 9 cents a kilowatt hour. 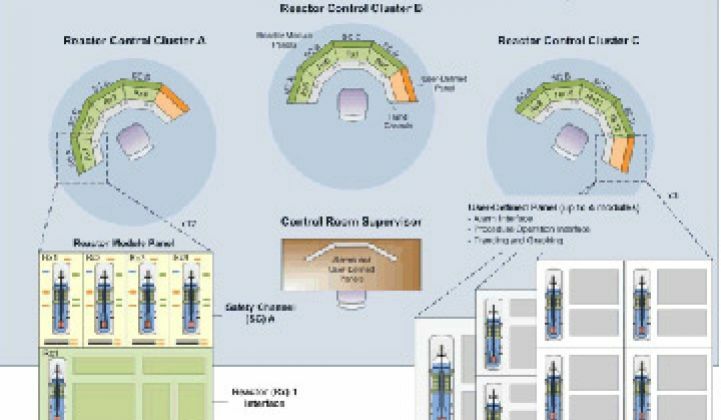 Modular reactors could also help accelerate the design approval process and construction time. Unfortunately, modular reactor development still takes quite a bit of time and money. NuScale and other startups like Hyperion Power Generation also face the challenge that larger institutions (such as nuclear contractor Babcock & Wilcox and Sandia National Lab) have unfurled their own modular reactors. Who do you think might have a better chance at winning the first contract for a Lego-like reactor? Other concepts to watch in this space: the long-awaited fusion reactor from Tri-Alpha Energy (NEA and Venrock are investors, but good luck getting them to say that out loud), the traveling (Wilbury) wave reactor from TerraPower supported by Bill Gates, and Kurion, a startup incubated by Lux Capital that says it can cost-effectively turn your nuclear waste into glass.